Aiming to produce Eco-Households to engage in vegetable production for consumption and income generation, the Organic Household Model Gardens (OhMG) Project anchored on a Food Sustainability Program was implemented from June-December 2018. The project was spearheaded by Ms. Victoria Padilla – Managing Director of Agro-Technical Assistance and Livelihood Opportunities in the North (AGTALONG INC.), in collaboration with the Rosemarie Organic Garden, RoHeim Inc., Teraoka Farm, Our Farm Republic, Green Top Organix', Bio-Organic Nutritious Garden Alternative as partner implementers. This OhMGs is a 7-month pilot project funded by ATI’s Grant System sought to instill values grounded on the principle of Organic Agriculture and an entrepreneurial mindset to the trainees. The trainees of the project were mentored to become OhMG Focal Persons and will work hand in hand with LGUs and Organic Focal Person for plan implementation. They will also be assigned to lead in sustaining, promoting and initiating OhMGs in their localities. 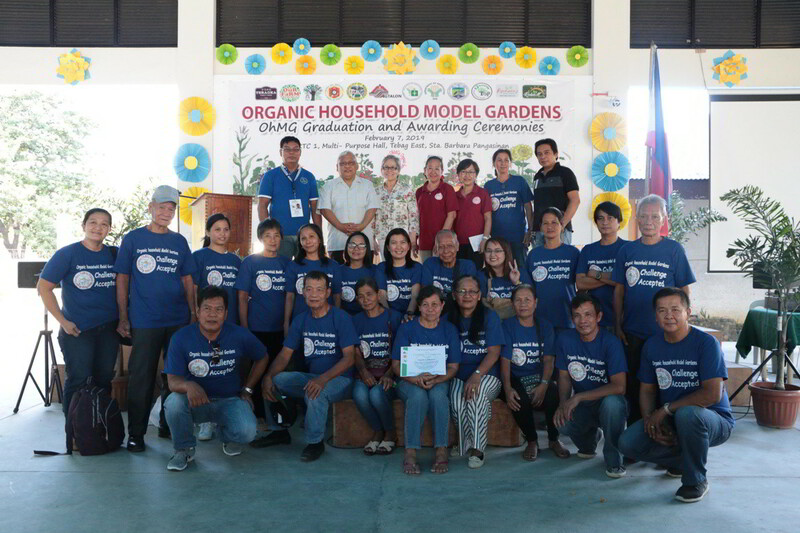 On February 7, 2019, a total of 105 graduates of from Lingayen, Manaoag, Mapandan, Mangatarem and San Fabian, attended their graduation ceremony with the theme “Building Eco-households and OhMGs to Meet the Food Security Challenge”. The activity was held at the ATI-RTC I Multi-Purpose Hall, Tebag East, Sta. Barbara, Pangasinan. Meanwhile, Dr. Rogelio C. Evangelista, Center Director of ATI-RTC I delivered his congratulatory remarks to the graduates through a VTR as he attended an important activity in Ilocos Norte. “Nakita natin na yung outcome ng kanilang training ng pitong buwan ay nagbigay sa kanila ng dagdag kaalaman at ito ay makakatulong sa kanila sa iba’t ibang pamamaraan ng pagtatanim upang ma-transform ang kanilang bakuran bilang isang Organic Household Model Gardens.”, he said. He also expressed his appreciation to the Local Government Units of Lingayen, Manaoag, Mapandan, Mangatarem and San Fabian for their cooperation to the project. Also graced the activity was Mr. Bienvenido T. Masbang, Chief of the Partnership and Accreditation Services Section. On his message, he encouraged the graduates to start applying and practice technologies they have learned. “Napakaimportante na mai-apply nyo agad ang inyong mga natutunan nang hindi nyo makalimutan. For sure, may promising job na naghihintay para sa inyo.”, he added. The project fortunately caught the support of Local Government Units in Pangasinan, Department of Agriculture-Regional Field Office I and the ATI-RTC I.